Joe Balducki, 91, passed away at his home June 4, 2018. 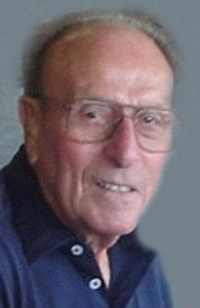 Joe was born September 23, 1926 in Des Moines to Louis and Esolina Balducki. He served in the United States Navy. Joe was a cement finisher and retired from Iowa Power after many years of service. Joe is survived by his wife, Wanda Swayne; children, John Balducki, Joette (Pat) Carlino, Julia Balducki and Jeri (Michael) Moritz; seven grandchildren; ten great-grandchildren; and a host of extended family and friends. The family will greet friends Saturday, June 9, 2018 from 10 a.m. to 11 a.m. with the funeral service to follow at 11 a.m. at Hamilton’s Funeral Home, 605 Lyon Street. Joe will be laid to rest at Sunset Memorial Gardens Cemetery. Memorial contributions may be directed to the Puppy Jake Foundation.